Decades of research have established that dental implants are the best way to replace missing teeth; that's why we recommend using them whenever possible. There is simply no other option that offers the same advantages (View Top Reasons to Choose Implants). However, we need to make sure the requisite conditions exist in a person's mouth to ensure the high success rates normally associated with this life-changing treatment. Are you a candidate for dental implants? Let's examine the criteria for success. Implants are placed into the jawbone during a minor surgical procedure done at the dental office. To create a lasting connection that will anchor your new teeth for a lifetime, there needs to be sufficient bone volume and density in the jaw to support the implants. Adequate bone is not always present because bone loss always follows the loss of a tooth. That's because bone is a living tissue that rebuilds itself constantly. To do so, however, it needs a particular type of stimulation, which comes from the teeth. When even one tooth is lost, the bone beneath it begins to melt away, or resorb. The longer the tooth is missing, the greater the bone loss. In the past, individuals who waited too long could not have implants because they lacked sufficient bone. Today, it has become quite common to regenerate the jawbone with routine bone-grafting techniques. To accomplish this, dentists most often use laboratory-processed material that stimulates the body's own ability to regenerate bone, rather than moving bone from one part of a patient's body to the site of the missing tooth. In fact, bone grafting material is often added to an extraction site when a tooth is removed, just to make sure implants remain a viable option. There are some situations where the use of implants might have to be delayed: For example, in a child, it would be ideal to wait until growth and development of the jaw has been completed. Or, in the case of individuals with diabetes, the underlying medical condition should be controlled before proceeding. Once that is accomplished, these individuals can achieve success with implant replacement teeth that is comparable to what people without chronic medical conditions experience. 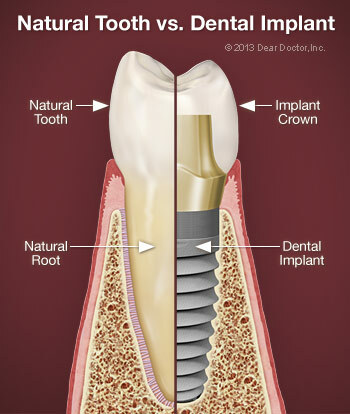 The best way to determine if you are a candidate for dental implants is to make an appointment to come in and see us. We would be happy to examine you and discuss all of your tooth-replacement options.